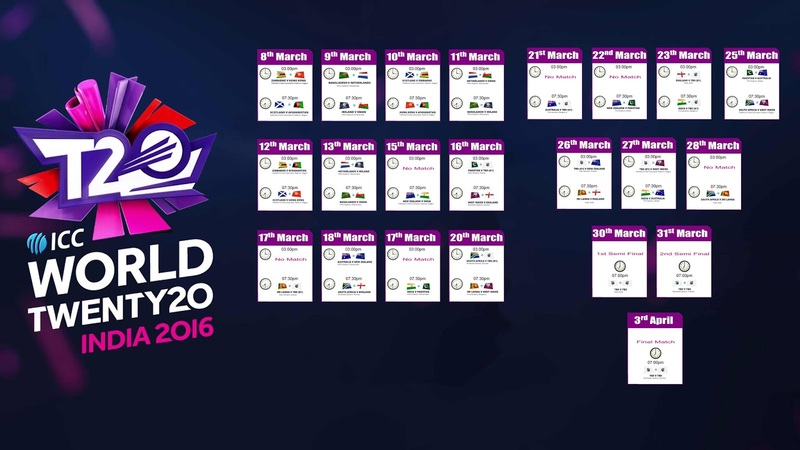 ICC 2016 Twenty 20 Cricket world Cup will be started on 8th March 2016. Hong Kong vs Zimbabwe will be the opening match at ICC 2016 T20 world cup. Here is the complete ICC T20 cricket world cup 2016 match schedule in Indian Standard Time (IST). All the matches are scheduled at 3:00pm or 7:30pm in Indian Standard Time. You can download the T20 schedule in JPG format on bottom of this page. There are 16 countries were participating in 2016 T20 world cup. India is hosting 2016 T20 world cup through 7 international cricket stadium around the nation. Kolkata, Bangalore, Mumbai, Dharamshala, New Delhi, Mohali and Nagpur are these seven venues qualified for this cricket season cricket carnival. Sri Lanka is the defending Champions of T20 World Cup. This edition is playing with 16 nations, 10 icc members and six qualifiers. Two groups (Group A, Group B) were placed with four qualified teams. And only one teams from each group (totally 2 teams) will advance to second round. Top Eight teams will automatically advance to second round, to Super 10 Stage. According to the official ICC T20 Cricket World Cup match Schedule, Host nation, India will play their first match against New Zealand on 15th March 2016 and against Pakistan on 19th March 2016. Then against winner of Group A and against Australia as scheduled. 2016 T20 Cricket world Cup is the sixth edition of the ICC T20 World Cup. First edition was in 2007 hosted by South Africa. India is the prime title winner of ICC Twenty 20 World Cup, it was against Pakistan in 2007. Second edition of T20 World Cup was in 2009 hosted by England and Pakistan was the Title winner by defeating Sri Lanka in Final. The 3rd edition was in 2010 instead of 2011 because of the ICC Cricket World Cup 2011(50overs). 2010 was hosted in West Indies and England won the Title against Australia. Fourth Edition of T20 world cup was in 2012 hosted in Sri Lanka and won by West Indies. The last edition, fifth one, was in 2014 in Bangladesh and won by Sri Lanka. Sri Lanka were the finalist for three times and won only in one at ICC T20 Cricket world Cup. Pakistan and India were two times finalists and one Title win. Fir group stage matches of 2016 ICC T20 Cricket world cup were completed on 13th March 2016. And Super ten matches of 2016 T20 are starting on 15th March with India vs New Zealand. From the Group Stage, Two Teams were advanced to super ten. Afghanistan and Bangladesh are the two teams, who advanced to second round of T20 world cup 2016. There are 16 Teams were Participating in ICC T20 Cricket World cup 2016. All the ten full members of ICC and Six Associated members were selected through the qualification. India, Australia, England, New Zealand, Pakistan, South Africa, Sri Lanka and West Indies, who were the ICC Top eight ranker will automatically advance to the second round two teams from other eight participants will selected after first round to the second Round. Here is the complete match schedule of ICC T20 Cricket World Cup 2016 in Indian Standard Time. designed by indiancrux.info, referenced from Wikipedia and ICC T20 World Cup 2016 Official Portal. Please comment below if any errors or mistakes found on this page. Yellow Colored Teams were Advanced To the Semi Final of ICC Twenty20 Cricket World Cup and Red Colored Teams were Eliminated from the Game. Zimbabwe won the first match of ICC T20 World Cup 2016 against Hong Kong on 8th March 2016. First batted Zimbabwe scored 158 runs from 20 overs with lose of eight wickets. And Hong Kong only score 144 with lose of six wickets from 20 overs and lost for 14 runs. Hong Kong failed to achieve the target even they have four wickets remaining. Afghanistan won the second math of ICC T20 World Cup 2016 by 14 runs against Scotland at ICC T20 Group Stage Match. Afghanistan won the toss and scored 170 from twenty overs with loss of five wickets. Scotland scored only 156 from twenty overs with loss of five wickets. Bangladesh won against Netherlands on 9th March 2016 by eight runs, And Oman won against Ireland by 2 runs on the same day. Zimbabwe won by 11 runs against Scotland on 10 March 2016. And Afghanistan won by wickets against Hong Kong on the same day. On 11th March 2016 Matches between Netherlands and Oman, Bangladesh and Ireland are abandoned due to rain. This is the first time in 2016 ICC T20 Cricket World Cup Match Schedule that matches get cancelled against the schedule. No re scheduling no re matching were announced at ICC T20 Cricket world cup 2016. On 12th March, Afghanistan won by 59 runs against Zimbabwe and Scotland won by 8 wickets against Hong Kong on same day. Afghanistan Scored 186 with loss of six wickets then Zimbabwe scored only 127 and all out 20th over with two balls remaining. Hong Kong scored 127 with loss of 7 wickets from 20 overs and Scotland scored only 78/2 in eight overs. Due to rain match officials declared with DL rules as Scotland lost by eight wickets. All the first round matches were completed from two groups. And one team from each group were advanced to the second round.There are no match in 2016 ICC T20 Cricket world cup schedule on 14th March 2015. India Lost their first match on 15th March 2015 against New Zealand for 47 runs. First batted New Zealand scored 126 with loss of 7 wickets and Indian players were all out for 79 at 19th Over. Pakistan won their first match in Group Stage of ICC T20 World Cup 2016 against Bangladesh on 16th March 2016. The victory is by 5 runs. On the same day the match between West Indies and England was won by West Indies by six wickets. Chris Gayle is the man of the match, who bring the match in to West Indian side with wonderful Century. Sri Lanka won against Afghanistan by 5 wickets on 17th March 2015. Afghanistan chose bat first after winning toss and scored 153 with loss of 7 wickets. 153 against Sri Lanka is a very good performance. Sri Lanka find the target at 19th over. On 18th March 2016, New Zealand won by 8 runs against Australia. First bated New Zealand scored 142 from 20 overs with loss of eight wickets. And Australia were scored only 134 from twenty overs with loss of nine wickets. On the same day, the second match between South Africa and England was the most beautiful match, the real T20 smash game, was won by England. England won the match by two wickets, with second highest run chase in T20 match history. First batted South Africa scored 229 with loss of four wickets. Both Openers, Hashim Amla and de Kock were scored half centuries. and JP Duminy not out with another half century. Second batted England started the hunting in very beginning. JE Root scored 83 from 70 balls for England and they find the target in 20th over with loss of eight wickets. On 19th March 2016, Schedule match of ICC T20 Cricket World Cup 2016, India vs Pakistan an exciting match has been played in Himachal Pradesh Cricket Stadium. India never lost a T20 world cup match against Pakistan. India won the toss and send Pakistan to bat first. Pakistan Scored 118 from 18 overs (two overs reduced due to rain). And India won by Six wickets through the Half century of Virat Kohli. On 20 March 2016 South Africa beaten Afghanistan by 37 runs and West Indies won against Sri Lanka by 7 Wickets. Match between Bangladesh and Australia was 21st March and Australia won the match by 3 wickets. New Zealand won against Pakistan on 22nd March 2016. It was by 22 runs. First batted New Zealand scored 180 with loss of 5 wickets and Pakistan only scored 158 with loss of five wickets from 20 overs. On 23rd March 2016, England beat Afghanistan by 15 runs. And second match between India and was ended with big excitement. India won the match by 1 runs. First batted India scored 146 with loss of seven wickets. Now India in second position in Point Table. England won the semi final match against New Zealand on March 30 by seven wickets. West Indies won the second semi final match against India on 31st March 2016 by seven wickets. 2016 Twenty20 world cup final match was played on 3rd April 2016 between England and West Indies. West Indies won the final match by four wickets.